A die-cut folded greeting card, with a blank inside, which comes with an envelope and a sticker sheet filled with quotes and traditional messages like "Happy Birthday" and "Happy Anniversary" so that you can personalize your card. 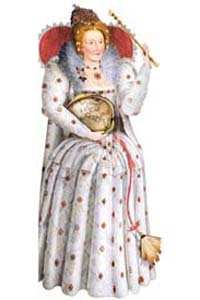 'Good Queen Bess' began England's age of colonization, thwarted invasions by Spain and France, and presided over a golden age of artistic achievement. Politically astute, this 'Virgin Queen' refused to marry rather than risk being drawn into political intrigue, and by refusing to 'make windows into men's souls' she reached a religious settlement between Catholics and Protestants, saving England from civil war. Elizabeth could play many musical instruments, was a voracious reader, and loved to dance well into old age.